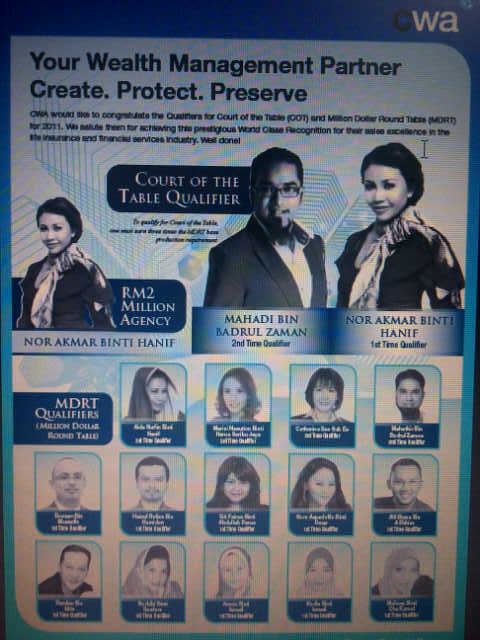 Full Page Congratulatory Advertisement is published in The Star newspaper today for our MDRT achievers! Get your The Star newspaper today! "CWA congratulates its Qualifiers for Court Of he Table(COT) and MDRT for 2012. We salute them for achieving this prestigious WORLD CLASS recognision for their sales excellence in the life insurance and financial service industry. A Full Page Congratulatory Advertisement is published in The Star newspaper today, on 27th March 2012. Congratulations to all you again!